October is National Farm to School Month! During the Hawai‘i Farm to School Conference, participants will examine the supply, distribution, and procurement of locally grown foods for Hawai‘i’s schools, along with successful models for implementation through education. Presented by the Hawai‘i Farm to School and School Garden Hui and The Kohala Center, this important gathering of food systems stakeholders will promote the knowledge and best practices needed to develop and sustain a statewide farm to school program to re-grow Hawai‘i’s agricultural economy, future farmers, and healthy schools and communities. Registration is $50 per person and includes ʻono and pono breakfast, lunch, and refreshments as well as conference materials. SCHOLARSHIPS: Educators and students may apply for scholarships of up to $200 per person from the Kōkua Hawai‘i Foundation’s Mini-Grant Program for reimbursement of conference registration fees and/or neighbor island travel expenses. Download the application at http://kokuahawaiifoundation.org/minigrants. Scholarship application deadline for educators and students is September 15th. A limited number of conference registration scholarships of $50 each are available to non-educators at the conference registration page. Register Online by October 1 at http://hif2sc.eventbrite.com. For more information, email [email protected]. 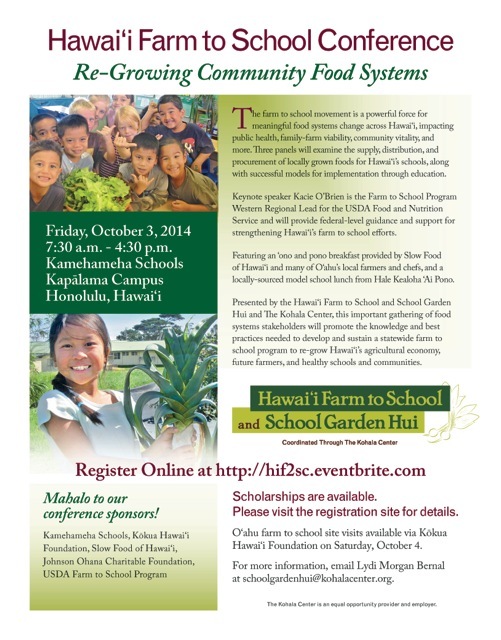 Oʻahu farm to school site visits are available via Kōkua Hawai‘i Foundation on Saturday, October 4th.